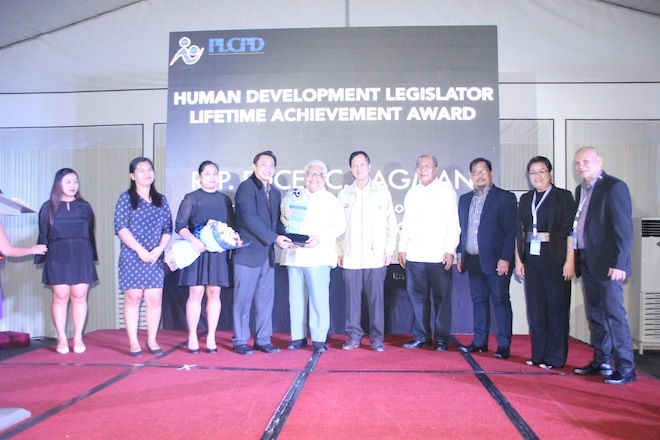 The Human Development Legislator is a recognition awarded to members of PLCPD and other members of Congress who have contributed to the advocacy for legislation instrumental in advancing human development in the Philippines. The award is given to legislators who, during their term as representatives of their respective districts or sectors, have championed population and human development through authorship of relevant bills, sponsorship of appropriations for relevant programs, exercise of oversight powers, and other legislative action. In time for PLCPD’s 25th anniversary in November 2014, the organization resolved to confer a special award, the Human Development Legislator: Lifetime Achievement Award, to individuals whose contributions in the area of human development have not only benefitted Filipinos through the laws they have authored, but have also made a tremendous impact on the discourse and practical realms of human development, particularly in the areas of human rights, women’s rights, sexual and reproductive health and rights, and children’s rights, among others. The first recipient of this award was Senator Leticia Ramos-Shahani, an educator, diplomat, legislator, and PLCPD’s founding chairperson. On the occasion of the fifth anniversary of the enactment of the Responsible Parenthood and Reproductive Health (RPRH) Act of 2012, PLCPD is honored to present the Human Development Legislator: Lifetime Achievement Award to the main author of the RPRH Law; a reliable defender of women’s rights, RH, human rights, and social justice inside and outside of Congress; the embodiment of wisdom and work ethic that make up an outstanding legislator and public servant; the quintessential RH advocate, Honorable Edcel C. Lagman. The award was presented during “The RPRH Law at 5: Breaking through barriers, broadening horizons for advancing women’s rights and SRHR in the Philippines (a celebration of gains and achievements and a reflection on the challenges in the first five years of the RPRH Law)” held on 12 December 2017 at the Edsa Shangri-La Hotel, Mandaluyong City. In the inaugural issue of The Human Development Legislator: In Focus this September, we tell the stories of our chairpersons in both houses of Congress. Leadership was never too early for the young Risa Hontiveros curious of her environment. As early as her teenage years, she already knew she could take lead in social change. With threats posed to her community by the Bataan Nuclear Power Plant, Risa, a high school student then, established a group to advocate nuclear disarmament with her batchmates. They conducted symposia and other educational campaigns against the plant. But this had only been a stepping stone to the advocate that we know of today. Risa’s momentum in advocating for social justice grew as she joined other advocacy groups espousing health and women’s rights agenda. This advocacy work later reinforced her path towards representing the Akbayan Party List in Congress. However, Risa does not owe her activism to her leadership alone. In the tumultuous arena of politics, she finds her stronghold in the people she loves, in her faith, and, of course, in her pride as a Filipino. The beauty of the culture and nature of her country also continue to enrich her formation as an advocate for Filipino women and for basic human rights. Her center has also widened through her years of praxis in Akbayan where she had learned to engage with basic sectors. The Mental Health Bill for one would not have been crafted without the active participation and engagement of mental health advocates; the Anti-discrimination Bill would not have rallied through the Senate without the women and the LGBT sectors. The three gender and health bills that have been approved in the third and final reading in her first year in Senate are all a legacy of these sectors. Their intrepid advocacy materialized through the drafting of bills, the representation in hearings and technical working groups. The input and participation of individuals directly affected are what uphold the integrity of these bills to its last steps in legislation. However, the enactment of legislation that protects the vulnerable is no child’s play with all the systemic hurdles embedded in a still developing country. With these basic sectors’ dissociation from access to power, Risa considers that building the capabilities of people in politics is a major challenge in legislative work. Navigating through different political groups both in and out of Senate is also a challenge to her as part of the opposition in the minority. Nonetheless, Risa remains hopeful since the approval of the Mental Health Bill, the 120-Day Expanded Maternity Leave Bill, and the Anti-Hospital Deposit Bill. She also believes that there is a chance of passing six more bills in her second year in the Senate. While the senator promises to keep with crafting quality laws that empower Filipino sectors cut off from their right to basic services, she also promises to remain vigilant of the movements of the current administration. Risa’s compassion and grit make up her resolve to break the atmosphere of fear in Philippine society, and to reinforce the weakened consciousness and practice of human rights, gender sensitivity, and the respect for the rule of law. Teodoro “Teddy” Brawner Baguilat, Jr. Ripe from college, Teddy Brawner Baguilat immersed himself in public service through his brief tenure in the government (DENR), in media (GMA-7 and People’s News Service), and in a non-government coalition of advocates (Philippine Ecological Network, Inc.). His affinity for environmental protection, however, drove his career into serving a more concentrated stratum: his hometown in Ifugao. Teddy’s service to the people at large became more pronounced when he began what would be his sustained presence in the legislative and executive arena. As a neophyte legislator he had been focused on addressing the concerns of the humble community of Ifugao, the province’s best practices in cultural preservation and its rapid development rippled towards the national attention, signifying a milestone for the province. His passion to elevate the discourse on issues that pervaded his province—securing job demands, access to basic education, improved public health, to name a few—became his platform of governance and leadership in development of policies. His involvement in politics deepened when a window opened on 2010, providing him a seat as a representative in Congress. 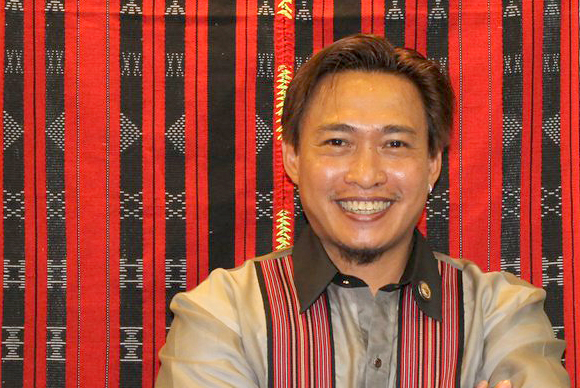 Baguilat then found his advocacy in an arena riddled with more hurdles. As a member of PLCPD, his resolve for public health branched further to reproductive health, HIV/AIDS, the first 1,000 days, and mental health. This goes alongside the protection of basic human rights of vulnerable sectors such as indigenous peoples and children. Though he had filed several bills such as those on public health, agrarian reform, farmers’ rights, national land use, mining, and forest resources, he admits that the life of these bills in Congress have not been a walk in the park. What impedes the passage of these bills, he mentions, is really the opposition it garners not just from within the Congress or the administration, but with private sectors as well. Pushing for these advocacies also encounter challenges in that advocates are often always confined within the same circles. This is why, as the PLCPD chair-elect in the House of Representatives for the 17th Congress, Teddy strives to expand and strengthen the Philippines’ cultivation of basic human rights with his fellow legislators. On his last term as a Representative of Ifugao, he only hopes that the fight materialized through these bills finally bear fruit. As the basic sectors slave through driving their struggle into the national discourse, Teddy promises to stay grounded and adamant in championing their voices at the halls of Congress to the end.